Ticket price includes entry, beer and pop. Attendees are welcome to bring snacks. West Seneca Rotary Club will be holding its first meat raffle on Saturday, Jan. 26, at Vigilant Fire Hall, 666 Main St., West Seneca. Doors will open at 6 p.m. and the first spin will be at 7 p.m. Tickets are $5 and can be purchased through West Seneca Rotary members and will also be available at the door. Tables of eight may be reserved. In addition to the meat raffle there will be a 50/50 and bucket of cheer raffles. Ticket price includes entry, beer and pop. Attendees are welcome to bring snacks. For questions or to reserve a table, please contact Lisa at 677-4928. The West Seneca Rotary Club is a service organization that has local members that wish to see a world where people unite and take action to create positive and lasting change — across the globe, in our communities and in ourselves. 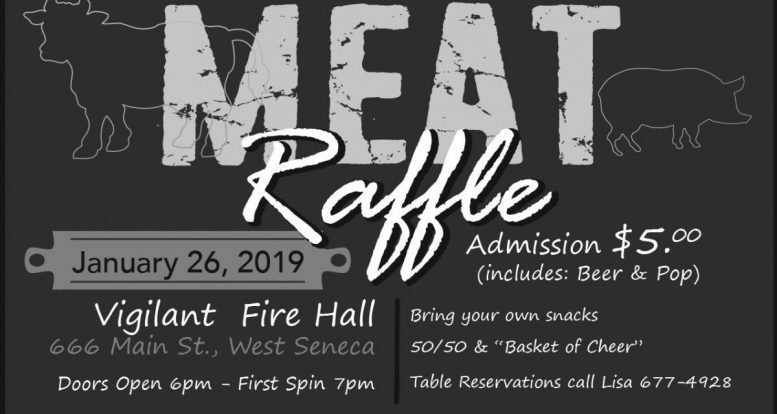 Be the first to comment on "Meat raffle planned by West Seneca Rotary Club"